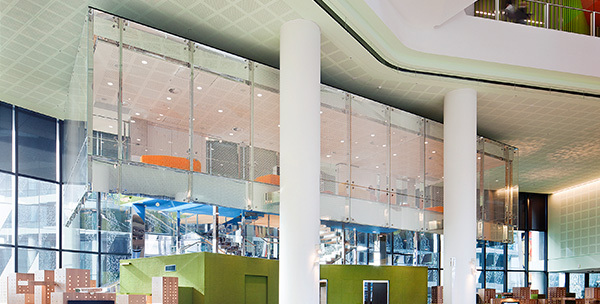 Heritage Glass were involved in two sections of this large scale project, being the Atrium Roof and The Cloud on level 6. The Atrium Roof unfortunately is not visible, however there was a great amount of skill required to complete this scope. This roof was factory glazed to steel frames, with frames up to 13m long x 3m wide . There were a total of 7 frames. Each frame was made up of up to 12 Double Glazed Units (DGU’s) at 35.52mm thick. Once these steel frames were factory glazed they were transported to site and craned into position. Engineering was required to ensure the DGUs would fit ‘snug’ into the steel frames but still allowing enough tolerance for the glazing. The glass was designed for strength and U-values required by the designer. Additionally, a self draining, thermal broken system was used to eliminate leakage, and minimise heat transfer into the building. As a further preventative, an additional secondary draining system was also used. To review a visualisation of the different layers of work as described above, please download the pdf here. The Cloud has suspended glazing to achieve a frameless floating glass box being the design intent. The aim was to have all glass fitted into the steel frames, once again allowing just enough tolerance for installation. Engineering was required to allow for the specifications of the glass, hardware, and glass thickness to achieve the glass frameless box. Tolerances and measurements had to be accurately engineered and calculated to also overcome lead times required by the builder. Glazing was completed off a crawler crane and utilisation of a ‘glassboy’, our own glass specific crane. This was needed for the accurate and precise positioning required for installation as well as overcoming surrounding works and accessibility in the area. HGP was able to provide solutions based on our variety of skills, expertise and knowledge across the team.